Among Dugan’s most sought after vases are the little Twigs. No matter what the shape, demand exceeds supply because the design and craftsmanship are so irrepressibly charming. The Twigs pattern consists of four principal elements: (a) a supporting base, two and three-sixteenth inches in diameter, its upper surface covered with “bark,” (b) three bent twigs (burly branches, really) which hold the receptacle, each twig also covered with bark, (c) a container with nine exterior smooth panels, and, with the exception of a pattern variant, (d) three spindly, barren twigs that extend up from the bolstering twigs on to the panels, each spreading to rangy four pronged vine-like twigs. Although not as desirable, taller eight- to nine-inch Twigs bud vases are also available. They are easier to track down and less costly than the little vases. The aqua and peach opal Twigs lie somewhere between the small vases and the bud vases in height. Four of the little Twigs have previously been discussed in books, newsletter articles, and online. The other two have only recently been reported. Some standard Twigs have been “whimsied” in one way or another. Two shapes are line items, two others probably line-item derivatives, another in all likelihood a bona fide whimsey, the other presumably the proof from which all the rest were configured. The crimped jack-in-the-pulpit vases have always attracted attention because they were so artfully created. One of two “available” shapes, they have historically been the most talked about and are arguably the most popular shape. They stand from three and one-half to four and one-fourth inches tall. The JIPs are line items. It is unusual, although not unheard of, for a line item to have been so extensively whimsied, an inherently labor intensive process. It’s no wonder, then, there aren’t all that many of the JIPs around. Also a line item, the non-crimped three-ruffled is, like the JIP, an available shape. Graceful and well-proportioned, it rarely receives the accolades it deserves. These vases range from four and one-fourth to four and one-half inches tall. Handsome and bold in concept, the crimped round might be thought of as a violet vase. A small spray of spring flowers or other pastel blossoms would complement the base color. Probably a line-item derivative, not many have been reported. They are four inches tall. The non-crimped round is the most basic shape, in all likelihood the proof. This is the shape that was offered to wholesalers in the April 1906 Butler Brothers sale catalog in non-iridescent opalescent glass. Extremely rare in carnival, I know of only this one. It stands four and one-fourth inches tall. The remaining shapes—two with the standard design, the other a pattern variant—are seductive because few collectors have known until now about them. The mesmerizing spittoon shape is in all probability a whimsey. The one illustrated is the only one of which I am aware. It stands four and three-fourth inches tall. 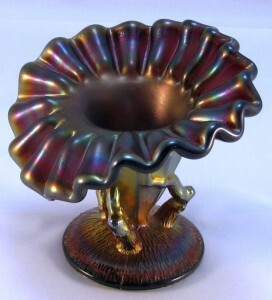 This spittoon is surely more decorative than utilitarian. It would be tough for a chewer to find the mark when he (or, I suppose it could be, she) is expectorating a mouthful of muculent tobacco. 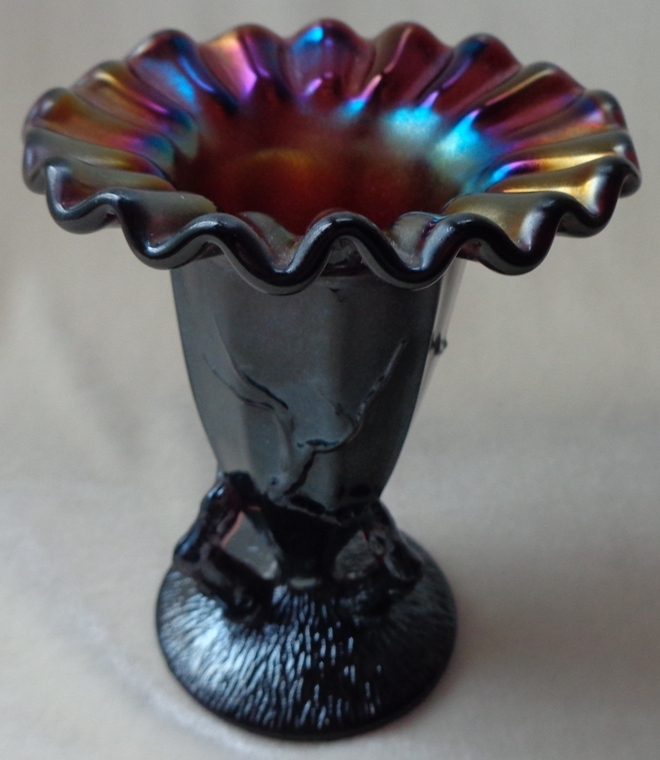 The six-ruffled, likely a line-item derivative, stands four and one-fourth inches tall. It is an elegant and refined shape. The most recent shape to be reported, it had been in an in an upstate New York collection for years before changing hands a few months ago. Standard small Twigs have been confirmed only in a generic amethyst, lighter than what contemporary collectors call purple, fiery amethyst, and oxblood but darker than lavender. While some say marigold also exist, I know of none. 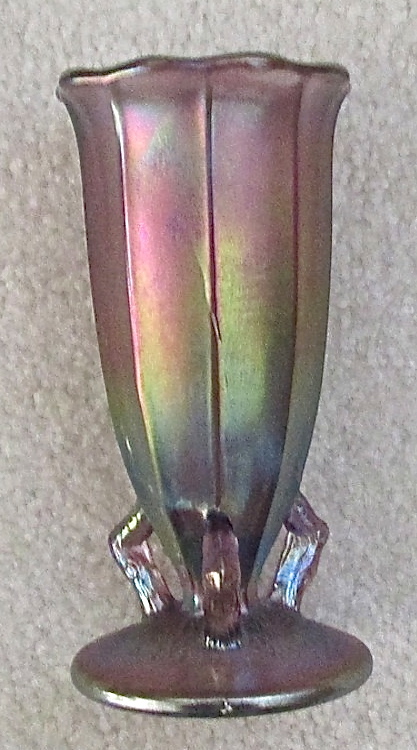 Iridescence ranges from electric or multicolor inside and out to, at best, marginal in quality. Many have a nasty stark steel cast. When Twigs vases sell, color counts: the best bring premium prices, the mediocre modest sums. On occasion, little Twigs are iridized only on the inside, with just the base color visible on the outside. Kate and Bill Lavelle’s crimped round, electric on the interior, is a pretty one of these. The vases illustrated above, not counting Kate and Bill’s, are owned by Don and Kris Dorais. 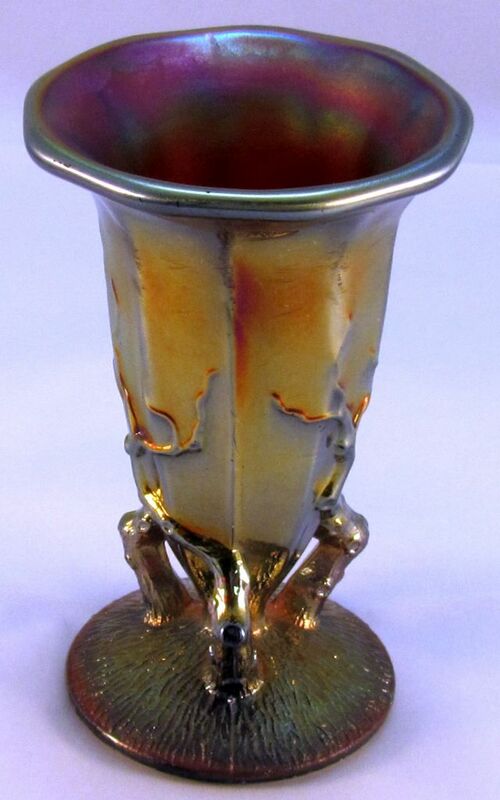 They acquired the crimped JIP, three-ruffled, and non-crimped round by way of eBay, the crimped round at the Whitley auction, and the spittoon shape and six-ruffled privately. Theirs is an awesome mini-collection. The Twigs Variant pattern is different in one significant respect from standard vases. It is missing the vine-like twigs on the paneled portion of the receptacle. The variant’s absent element has led me to believe its mold was a prototype soon replaced by the more elaborately designed standard Twigs. It is probable it, like the other, was produced circa 1906, just before the non-iridescent opal vases were put on the market. If that’s the case, this earlier mold was set aside for a time, brought to life, perhaps by accident, three or four years later for a minuscule carnival run. 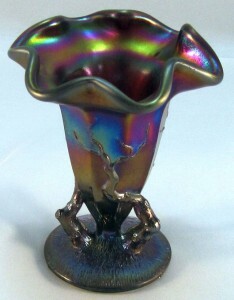 The base color of the only Twigs Variant I know of is lighter than standard vases, lavender rather than amethyst. Its iridescence is a comely, even pastel. 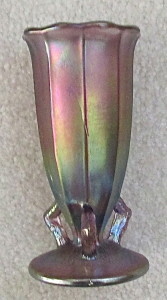 Arnold and Dorothy Snell, owners of the lovely, approximately four-inch tall Twigs Variant, bought it at the Southern California convention auction in 2003. There, Arnold recalls, they somehow wrestled it away from a well-known vase collector. Before that, it had been in the Rabon and Melpha Hall collection in Kentucky. The Halls specialized in small vases and hat shapes. Reproductions of little Twigs are known to have been made. 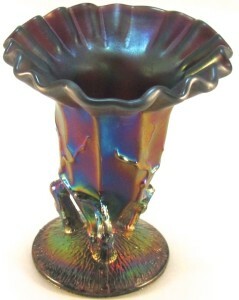 Photos of two Terry Crider-signed (in script, bottom of base) vases are posted at the Carnival Glass 101 website: http://www.carnivalheaven.com/carnivalglass102/id121.htm#terry_crider_twigs_vase. The signature could, of course, be removed; erroneously leading potential buyers to believe a vase is old. Unmarked repros may also have been made and marketed. It looks like the Crider vases were produced from the Twigs Variant mold. It is possible Crider also got hold of the standard Twigs mold, so repros of these may be out there, too. The cylindrical Twigs bud vases—most eight to nine inches tall, a few an inch or so taller yet—are known in marigold as well as amethyst. Most of the marigold are god-awful in appearance, clear at the bottom with weak, washed-out surface color at the top. While beautiful amethyst can be found, the iridescence is frequently a ghastly gun metal or a dreadful dull gold. The bud vases are products of the Diamond years of the plant’s operation. They are illustrated in several industry publications from the early teens to 1931, the year the firm folded. Dave Doty reports three aqua opal Twigs vases as having sold since 1993. 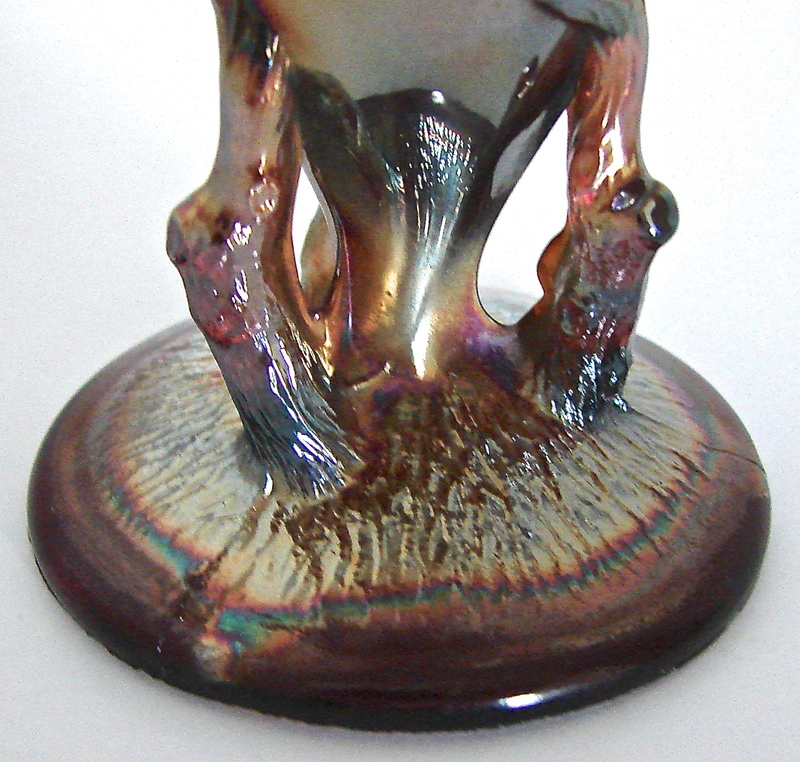 According to Diane Fry, at Carnival Glass 101, a peach opal sold at the 2007 ACGA convention auction. In November 2014 a peach opal (maybe that same one) changed hands at a Seeck auction in Mason City, Iowa. An aqua opal is illustrated on the Twigs page of the Doty website. The sides of the container are essentially straight up, the top scalloped. Compared to the JIP with which it is pictured, it appears to stand about six inches tall. 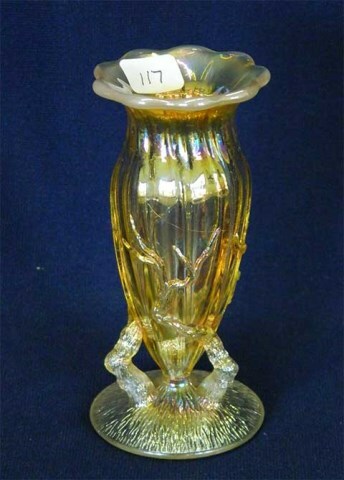 It looks like it was made from the same or a similar mold as standard little Twigs vases, as does the peach opal that recently sold. 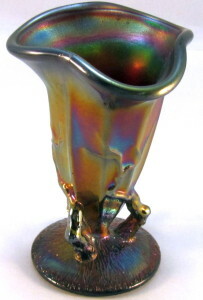 While slim, the vessel of the five and one-half inch tall peach opal is, in contrast to the aqua opal, more bulbous and is pulled in just below its flared and scalloped top. Its pearly opalescence is confined to the interior of the top. Elsewhere, the color is a shiny dark marigold. On all other peach opal Dugan and Diamond vases with which I am familiar, opalescence is found only on the exterior. Many collectors doubt the opalescent vases are “old.” But it is not likely anyone can say for sure what company made them or when. At present, the evidence seems circumstantial. 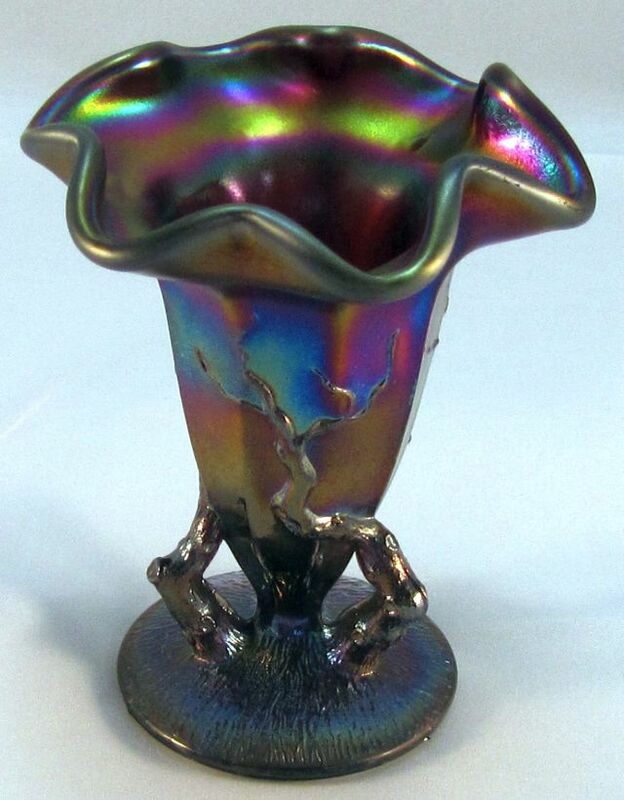 There are obviously those who are convinced, or want to believe, the iridized opal vases are Dugan or Diamond, as the aforementioned aqua opal sold for $2300, $2500, and $2800. The peach opal brought $2700 this past fall. In any event, these vases have sparked spirited conversations and debate as to their provenance. When I began thinking about this article, I had anticipated a straightforward sweep of the six little Twigs vases in the Dorais collection and the Twigs bud vases. Writing the piece became more complicated when I learned of the Snell variant (I hadn’t realized its pattern was different from standard vases), the impending sale of and great interest in the peach opal, and the Crider reproductions. All of these sidetracks have made for an elucidating experience for me. I am grateful to Don and Kris Dorais, Kate and Bill Lavelle, and Arnold and Dorothy Snell for affording me the opportunity to showcase their glass and for repeated requests for detail. My thanks also to Neal Becker, Carl Booker, Barb Chamberlain, Greg Dilian, and Joan Doty for help along the way.